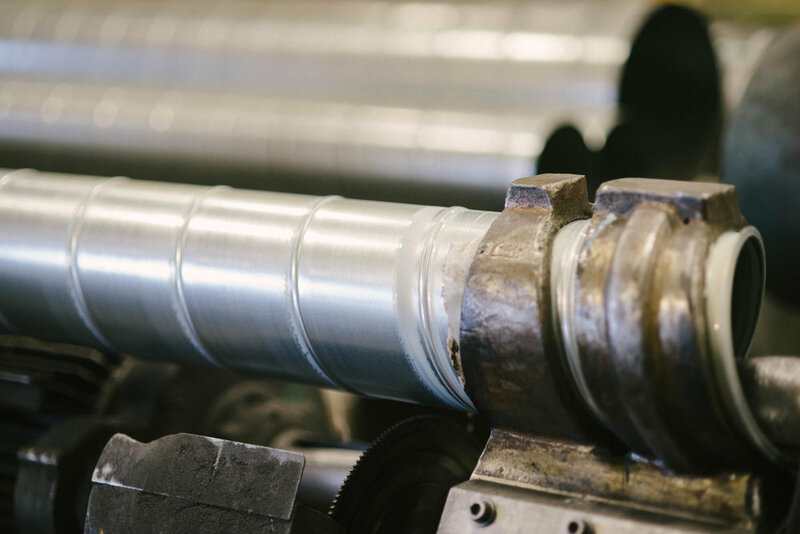 Our 20,000 square foot shop is fully equipped with state of the art sheet metal manufacturing equipment and can fabricate and provide all standard and custom sheet metal products. Our top notch equipment can make anything. Learn more about our custom fabrication options. Increases efficiency to reduce production costs, keeping installers competitive. Oval duct is a great alternative to spiral duct when space constraints are tight. We are the only shop in Colorado with in-house oval duct fabrication capabilities. Capable of providing spiral seam pipe up to 66 inches in galvanized, stainless steel and aluminum, plus paintlock and polyvinyl chloride-coated metals. Ensures a perfect weld in galvanized and stainless steel with no imperfections, every time. Guarantees a precisely cut sheet metal product without time-consuming hand labor. Provides a precisely lined sheet metal product to eliminate trimming at installation, saving installers time, labor, and money. The Roto-Die is a unique hydraulic brake used for bending sheet metal. Heavy-duty hydraulics are used in all of the sheet metal brakes, making bending operations quick and easy. This sheet metal bender is capable of making accurate bends from 24 inches up to 12 feet in length in 16 gauge to 10 gauge steel. Kuck Mechanical is the proud owner of a vintage Gripnail multihead machine. This machine is an automated fastener of insulation to duct. This museum-quality piece is still operating like the day it was made in 1973.